Is the FP Walking Brace right for me? Ideal for those who are recovering from an injury and need mobility support post-surgery or foot/ankle sprain. Try our Brace Advisor for personalized product recommendations to meet your needs! The Foam Walker provides semi-pneumatic support with Aircast full-shell protection and is available in 4 sizes (small, medium, large and X-large). Foam-filled aircells cushion the ankle for customized comfort and support. This support is effective in fracture healing and managing edema. Includes a hand bulb. Do not over-inflate aircells. Improper aircell inflation may cause significant skin irritation in patients with diabetic neuropathy. Reduce aircell compression with any visual skin changes or reported discomfort. Do not use this device on patients incapable of communicating physical discomfort. Like all lower extremity immobilizers, such as casts or braces, patients without sensation (i.e. post-op anesthesia, neuropathies, etc.) should be monitored frequently for "hot spots", skin irritation or wound management. Use caution when walking on slippery or wet surfaces to avoid injury. At high altitudes the aircells will expand beyond their optimal level. Adjust aircell pressure by tightening or loosening straps. I am thinking of buying this brace, I broke my ankle about 7 weeks ago and still need to wear a brace. I have a boot that goes up to my knee. I would need a size small. Could you tell how high the shaft on this boot is? The one I have is up to my knee. I need to replace my FP Walker, Medium 01F-M and this boot appears to be the same one. Can you confirm that it is? Thank you. IS THE SOLE ON MY FP WALKING BRACE SLIP-RESISTANT? i WANT TO GO BACK TO WORK, HOWEVER MY WORK IS REQUIRING ME TO WEAR SKIP-RESISTANT FOOTWEAR, CAN YOU ASSIST? I want to make sure I order the correct size. I wear a woman's shoe size 7 1/2 - 8. The widest part of my calf measures 16 1/2. Do I need a small or a medium? Hi. My daughter is in an air cast and this morning at school the fire alarm went off and she had to stand outside in the rain. The boot insert was soaked through and is still pretty wet. What would the recommendations be to dry the insert and is it a big deal that is got wet? Thank you. Is there an extra liner or pad that can fit in the boot to cushion around the top? If not what is suggested? I have a small aircast full length. I wear a size 8 women's shoe. The boot is really tight on my calf. Should I think about moving up to a medium size? Yes, we recommend if you are on the upper end of the size range to go up in size. A women's size 8 is a size Medium. I have a broken fibula & talus and have been in the boot for about a week. The first few days I didn't have any problems with the boot. I went in for a follow up on Tuesday and my doctor told me I wasn't putting enough air in the boot. He said I needed to do a minimum of 10 pumps for each valve. Within 30 minutes of doing that my leg is throbbing. I can still feel my toes, so I don't think my circulation is being cut off, but it's causing a lot of pain. I feel like 10 pumps is way too much... any suggestions? I fractured my heel bone recently and I am currently in a medium FP Walker after a fiberglass cast for two weeks. I am five foot tall and I wear a 7.5 shoe, & the cast just seems too tall and it causes pain at the site of my injury. Should I go down to a small XP Walker or would a short aircast work better? If your physician is requiring you to be in a tall walking boot you do not want to deviate from that without first speaking with them. In regards to the sizing, based on your shoe size you should be wearing a small, for a better fit. Is this boot effective to treat sesemoiditis in the big toe? Will it relieve pain or should I still expect there to be some pain while wearing the boot? The valve on one of the air cells on my XP cast does not function. Is there a replacement part? Is there any way to reverse the direction of the straps/fastners. I have the boot on my left foot and the straps fasten to the left side. I also have scoliosis and a shorter right side which inhibits my reach to the left side - leaving me one handed to try and fasten the boot which is impossible. if I could reverse the straps to fasten on the right I would be able to reach with both hands. The bottom Strap cannot be switched at all, it is bolted on to the boot shell. The two top straps can be removed and turned around if you can get them loose. We do replace thoses traps if they break but it is very difficult to unattache them. They are attached by a plastic disk on the back of the boot. How much does each Aircast Boot weigh? Is the bottom sole part on the aircast no slip oil resistant? I have a stress fracture in my tibia, would this work for me? My doctor said it started to heal and did not mention any type of casts or walking boots, but I feel like i need to get weight off my foot. Is SP Walker latex-free? I have worn for the past week and getting rash on my lower leg. For the first five days after injury I had taller boot and no rash. I shattered my ankle and broke my tibia & fibula 3 & 1/2 weeks ago. I was given an Air Cast FP a week and a half ago. It is a Large 01F-L. I wear a size 9 or 9 &1/2 in everyday shoes and a 10 in running shoes. Every since my toes have been burning as if they are rubbing against the edges and top of the boot and my heal burns as well. I have to take the boot off several times a day just because of the burning. Am I doing something wrong? What is the maximum calf circumference for the long brace. And how long does my lower leg need to be? The calf circumference and overall dimensions of the boot change with each size of the boot, without knowing the size you would wear it is difficult to answer this question. Does the FP aircast have a fold over flap on the toes like my old one.I think I got it in 2002? Hi is there any way the straps can be shortened? I have a medium and I am around a women's size 7.5-8.5 and the strap for the top of my foot drags on the ground. Unfortunatly that strap can be made shorter, you could try tucking it in to the tob of the brace at the side. I have a broken ankle. I wear a size9 in a woman's shoe. The nurse gave me a large boot - sp walker because they didn't have a medium in stock. I can't adjust the air pocket at my ankle to be comfortable. It hurts my ankle where it's broken. Is this boot too big? Would a medium fit better? With a sock on, my toe is 1 1/4 inch from the tip of the boot. How high off the ground is the boot? As in, what height shoe should I wear for the foot that isn't wearing the boot so that my feet are even? The size chart provided for this walking brace is it in Australian Sizes? (I believe that is a size 5 1/2 Australian). Can you tell me what size I should purchase? Will the large fit around a calf that is about 20" around? Thank you for your question. The AirCast FP walker accommodates a 17" calf. You would need to purchase the extension straps to accommodate a larger size. These straps are not available on Better Braces and would need to be purchased direct from the manufacturer 800-336-6569.
after the surgery on my torn Achilles tendon. I will buy an Aircast FP Walking Brace. You do not need to buy anything extra, everything comes with the FP walking boot. My boot was fit properly by a nurse on checkout. Now my toes fall asleep because there is more pressure on the ball of the foot and my heel does not stay down. Fractured 2nd, 3rd, 4th metatarsals with stable lizfranc. Thank you for your question. A size small would be the appropriate size for a woman's shoe size 7. Make sure the air cells are empty each time you put the boot on. You will need to re-inflate each air cell each time you put this boot on. If you continue to have problems, it would be best to contact your physician regarding this fit concern. I am currently wearing an Aircast for a fractured ankle and am looking for a cover of some sort to keep the cast dry & clean, thereby eliminating mess & tracking indoors. Do you know of anything available. I was wondering if I could get replacement velcro straps for my Aircast? Thank you for your question. The replacement straps are not available through better braces. You can order them direct by calling 800-336-6569.
in the cells. So how do I deflate the cells? This cast is a "wonder" and allows me to get around until the ankle heals. Thank you for your question. When the boot is off you can apply a light pressure with your hand to empty the air cell. Some air will remain in the cell. Please contact us if you have any further questions. Is a Medium shorter in height than a Large? I wear 8 to 81/2 and the large is much too long, causing me to trip. It is also so tall that it makes it difficult to bend my knee. I understand a Medium will be an inch shorter in insole length, will it also be shorter in height? Thank you for your question. The height for a large boot is 17.4" a medium is 16" in height. When going up and down stairs with the boot, should the good foot go first or the booted foot first? What ever is most comfortable with you is ok. Sometimes I tell people "up with the good, down with the bad"
Are the air cell sacs filled with any type of fluid? I had leakage of some type in my boot and could only assume it came from there. I was not to get my boot wet as I had foot surgery. Was not blood or fluid from my foot. Thank you for your question. The air cells use only air to fill the cell. This brace does not contain any fluids. What is the purpose of the removable plastic liner that goes under the straps? Can I use the FP Walking Brace without it? The purpose of the plastic liner is to add rigidity and immobilization to the ankle. It will also prevent the straps from rubbing and causing friction that may irritate the skin. It would be recommended you use the anterior panel for those reasons. Thank you for your question. My big toe and the next two toes hit the ground when I walk. I have a medium boot and wear a 9 1/2 shoe. Should I be walking differently or is there anything I can adjust? If your heel is pressed to the back of the boot, your boot may be too small for you. Although the sizing chart states woman's shoe size 8-11 would fit a Medium it sounds like you have a smaller size. A medium insole should measure 10" where a small will measure 9". Check the insole size and if it's too small you can exchange it for a larger size, as your toes should not be hitting the ground. Thank you for your question. My daughter is wearing an aircast and it is slippery on any wet pavement, wlking to school in the rain is an accident waiting to happen. In addition, she works at an ice cream shop and the boot slips on the tile floor. Is there anything you can put on the bottom to prevent this? I thought of cutting some of the wave ridges to change the regular pattern as this appears to be the "skating point". Another option is to add black hockey tape (more sticky than white) to the bottom but this would peel off quickly. Unfortunately we don't have anything more to add to the boot. Of the walkers we supply the AirCast line is the walking boot with the best sole. It's designed to be more like a sneaker than other walker soles which don't provide as much traction. Adding anything more to the boot would inhibit the sole from providing the intended traction. I am wearing the race for the last 4 days. Under the foot the skin is irritated. I started wearing sock. Do I need to apply any cream for less irritation? If I use a walking stick/crutch, will it be better to heal faster. I have a tear in the tendon. The FP Walking Boot should always be worn with a sock. You will want to contact your doctor about the use of crutches. Once the irritation has healed, wearing a clean dry sock should solve the issue going fourth. I have been in an air cast following surgery. In 2 weeks I will transition to walking in the air cast. I will need a walking shoe for my other foot and want to have the same heel height as the boot. i am using a FP Walker, Medium 01F - M. Can you tell me the heel height on this boot? I just started to wear the FP walking brace due to a sprain on of foot ligaments. I have been using the boot to walk however, whenever I do I feel pain on the front of my leg. Is this normal? I have tried inflating and deflating the air cells to adjust the comfort but that really hasn't made a difference. Please refer to your Physician regarding the pain your having due to your injury. I wear a size 10 men's shoe. How do I decide whether to get a Medium or a Large size cast? We recommend going up in Size if you at the higher end of the range. I recommend a Large for you. Use the inflation bulb to inflate and deflate your boot. Inflate to a comfortable level. I have to wear the fp walker and put no pressure on my foot for another 4-6 wks how can I wash the brace n how long does it take to dry? We recommend hand washing the liner with a mild detergent and air dry. Do not use the washing machine or dryer. I have worn the boot for 3 days and my lower shin is very painful what can I do to ease this pain, possibly adjust the boot? I have broken my fourth metatarsal. Deflate the Aircells, they may be overinflated and pushing your shin forward in the boot. Try deflating them and they inflate to comfort. Yes we have replacement parts for the FP Aircast Walker. The Distal Aircell may be replaced. Please call a Product Specialist at 1-888-405-3251, so that we may place your order. Good day, i have ankle surgery 3 weeks ago with fiberglass cast on, then my doctor ask me to wear aircast fp walking brace after he remove the fiberglass cast. But still no pressure to my foot, But i am having problem on sleeping with this do you have some tips on how to sleep better with this on because the doctor said to put this on while sleeping. Thank you. Unfortunately, there are no recommendations as far as making the booth more comfortable to wear to sleep. If you have further questions please feel free to contact our product specialists at 888-405-3251. I have to wear an aircast walking boot for six weeks after having total ankle replacement. ( I have been wearing a plaster cast for the first six weeks). The doctor did not give me any instructions as to when to wear this walking boot. I have a wheelchair which I sit in to wheel myself around the house. Need I wear the walking boot even when I am in the wheelchair ? Thank you for contacting DJO Global. This would be a question that your physician would be better suited to answer. Is the edge of the front panel hitting the middle of your toe? Just move it down your foot so that it's flat on your foot. We can send you additional padding if you'd like. Please call us at 800-553-6019. Can one take a shower with the FP on? The FP walking brace can get wet. But, the sole is not designed to be 100% slip resistant and may not be safe to wear while showering. I suggest checking with your physician and ask if it is appropriate for your injury to take the walking brace off while showering or if you need to follow other bathing procedures. Should l wear my FP walker to bed? Wearing the walker to bed or not would be determined by your injury and your physician's treatment protocol. I suggest checking with him/her to see when it is appropriate to take the brace on and off. If you have additional product questions, please call 1-888-405-3251. Do you ship to the UK and how long does this take? Unfortunately we do not ship outside of the US. Can you buy replacement aircells for the short aircast boot? Mine will no longer stay inflated. Thanks alot. Yes, what size do you need? Is there a thinner sock that you would recommend to wear underneath the xl pneumatic aircast? How much do I inflate this, i.e., how tight should it be? When inflating, you want the boot to feel snug, but not so tight it is cutting off circulation. Start with 2-3 pumps in each cell, and then add one pump to each till it feels snug. How should I wash and dry the liner to eliminate smell and germs of fungal bacteria? You may hand wash, and air dry the liner. The Aircast FP Walker is indicated for moderate to severe ankle sprains and fractures. Typically, for plantar fasciitis we reccommend the Aircast Air Heel by day and the Doral Night Splint by night. Should you have any additional questions please let us know. I have the FP walker and one of the inflatable cells has come loose and won't stay in place... any ideas? Kelli, typically the AirCast FP Walker Aircell can stay in place with use of double sided tape. If you apply that tape between the aircell and the shell of the walker, that should keep it in place. Should you have any additional questions please do not hesitate to contact us at www.betterbraces.com again. how much does the aircast weigh? The Aircast FP Walking Brace weighs 2.7 lbs. How much does the FP in a small weigh? Can the brace be used with either leg? This brace is universal left and right. How much does the large FP aircast brace weigh? My husband coaches youth football and is wearing his foam walker out to practices. The fields are very muddy this time of year - I am looking for washing or cleaning instructions for the foam insert. Hand wash the liner in mild detergent and let air dry. Should I wear a long sock with this product? Do you offer a replacement Hand Bulb for this model? 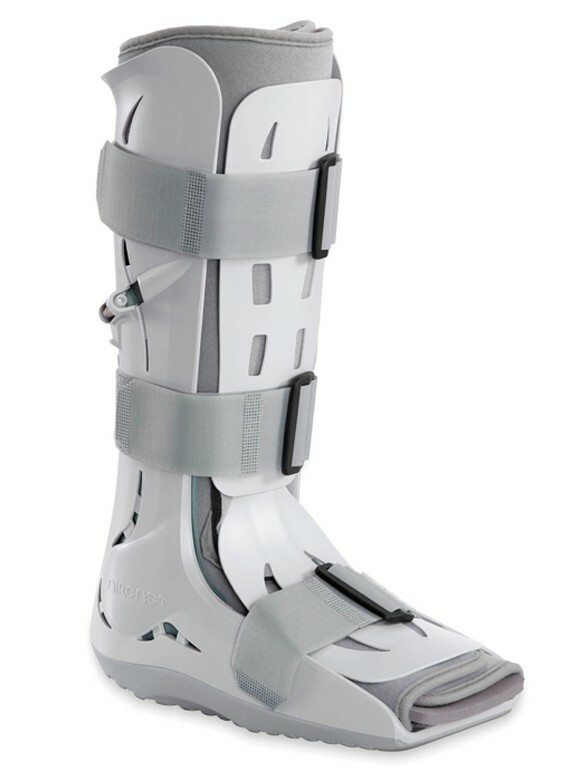 I just sprained my ankle (3rd degree) and was told I need to wear this boot for 3 weeks. Do you have to wear the boot at all times or can you take it off if you will be at your PC in sitting down position for several hours? The intention of a Aircast FP Walking Brace is to completely immobilize the lower leg/ankle/foot area. You'll want to consult your physician in regards to when you can remove the brace. What is the difference between the XP Walker and the FP Walking boot? The XP Walker has 2 more additional aircells than the FP Walker, for a total contact fit.. The FP Walker has just the 2 distal aircells. The XP Walker also comes with 2 socks to be worn with the boot. aircast fp walking brace. can you replace just the inside foam? It is gray . amazing support for post operative recovery! This boot is a life saver! About a month ago I had a bad fall and severely injured my ankle and leg. I fractured both my tibia and fibula in 2 and 4 places respectively. After weeks in a cast, they moved me to this walking boot. The support was just as good as my cast, but the positioning made me feel confident as I started to be able to bear weight! Unfortunately I still have a rod in my leg that will come out in a few weeks. I love the custom air pocket support in this cast. If there is pressure on the right side of my ankle where the rod is, it hurts big time! But this allows me to get the support I need in the way I need it for my specific injury. A lot of the time I pump up the left side 100% and the right side 20% and I still get full support! I'm getting more mobile every day and I couldn't be happier with this product :) Thank you! 5 weeks ago, I underwent 1 MTP w/Arthrodesis surgery for a severly arthritic large toe. After 4 weeks in a hard cast and on crutches I went back to the surgeon and said either cut it off or I would. I was destroying my shoulders (I AM 66). He put me in an AirCast Walking boot but admonished putting much weight on the font part of my foot. This boot has been a godsend. My only question is, how did George Lucas convince all of those extras to wear them as Storm Trooper Boots in Star Wars? I recently broke my foot and was provided a walking cast of sorts from the ER but was unhappy with the weight and feel of it. After much research, I found betterbraces.com and am I glad! I ordered the Aircast FP Walking Brace yesterday and received it this morning. What a huge difference! The comfort and feel is very good! Much better than the brace I was provided by the hospital. I'm hoping I won't need another visit to the ER anytime soon for a broken bone but if I am, I will visit this site and see what they have to offer. I'm sure it'll be much better than what a hospital or doctor's office will provide. I also feel that the cost was very good. You can't put a pricetag on comfort. I have been in the Aircast FP boot for 6 months. 1st orthopod said "old age" and tendon tear until I went back 3 months later and MRI showed ruptured posterior tibial tendon. 2nd orthopod specializing in foot injuries recommends surgery "when you are ready" so will wear the boot until surgery. Use 20 to 40 pound dog food bags to cover boot when I use the rototiller, work in the garden, wash the vehicles, feed/clean the chickens, mow/trim the yard, etc. This boot really shows the wear and tear that I am putting it through and will order a new one for "dress and special occasions" and the older one for daily wear. Going without the boot is not an option --- the pain and swelling are too much for me. My husband is wheelchair bound, we are both retired, we live in the country with limited income and limited family assistance so being off my foot for 8 weeks post-op is not an option at this time.. I thank God for the boot design and the tough outer shell that keeps me relatively pain free since I am up and moving early each day. The "air bags" even allow me to drive the vehicles where I need to go with minimal discomfort from the vibrations. A MIRACLE!!!! After a severe ankle sprain I was given a splint at the hospital and purchased some crutches. The splint offered very little support and the crutches made it impossible to do anything. Fortunately the orthopedic doctor I saw for follow up the following week put me in this aircast boot. What a difference! I could move around when I had to without pain because of the support it gives. The interior airbags allow you to adjust the support level as the swelling of the foot changes, or as needed for comfort. A bit more for walking and a bit less for when relaxing with your foot up. Unless you have someone who can wait on you hand and foot (no pun intended!) get one of these....I HIGHLY recommend the Aircast boot! I have second and third metatarsal fractures. Originally they gave me a splint. The orthopedist switched me to this boot, it has been very painful, I have no idea how much is too much or too little pressure, either the place of fracture hurts or the rest of the leg. The first night wearing it was very painful. I am going into 9th grade. My 7th grade track season didnt start off great. I have had two stress fractures, RSD, and osteopenia in the past year. They put me in a black camwalker at first. It was very heavy, and the bottom wore out very quickly. That fall when they discovered the second stress fracture I was put in a cats for six weeks. I then recommended to my doctor instead of buying a new black camwalker to get me this. I was still on crutches when I got it. This is a lot easier to use than the black camwalker. I walk better in it and it fits my foot better. I am still currently in this camwalker and love it. I would highly recommend this boot! I received this brace when it was discovered that I have a rather large stress fracture on the heel of my foot. Needless to say it was quite painful to move much less walk on my foot. The brace helps to stabilize the heel and the air cushion is great, it is like walking on air. My shepherd dog however thought that the inflate/deflate pressure guage would make a great "chewie" so that will have to be replaced. It is somewhat awkward to walk with but is alot better than being in a hard immovable cast. One other note - due to the height of the heel on the brace I find that I have to wear a shoe on the other foot with a higher heel to keep me level. So for the next 6+ weeks this will be my constant companion. Have a broken 5th metatarsal. This boot stabilized my foot and reduced the pain a lot. Being able to remove it for showers is a huge bonus!